The Youth Queer Media Program participants have been working since January to complete their short films exploring the themes of isolation, coming of age, gender bending, and first loves. The films created tackle issues from everyday life: queer identity in a contemporary world, facing challenges, and overcoming obstacles. Fairy Tales is proud to present the World Premieres at the festival with a Q & A after the films. “Weight” is an animated short. This piece was created using a mix of photographs and hand drawings that were animated in Adobe After Effects. In under 3 minutes, Weight creates a visual metaphor about the micro-aggressions faced by queer people. The rocks represent the burden of feeling rejected by others. Each instance is tolerable one at a time, but as the instances build up they create a bigger impact. The soundtrack was composed exclusively for the short. Hannah has loved cartoons as long as she can remember. Recently she has decided to try her hand at making her own animations. This project is her first digital animation, although she hopes to use the skills she learned to make many more. Hannah has a BSW from the University of Calgary and will be studying law in the fall. This film follows three very different individuals within the queer community, with three very different experiences, and very different interpretations of these experiences. The film hopes to capture the intimate feelings of these individuals and express how their experiences in the world, both queer and not queer, has shaped who they are, and how they identify. Renee is an 18 year old from Calgary. They attended the Centre for Preforming and Visual Arts for high school studying dance. 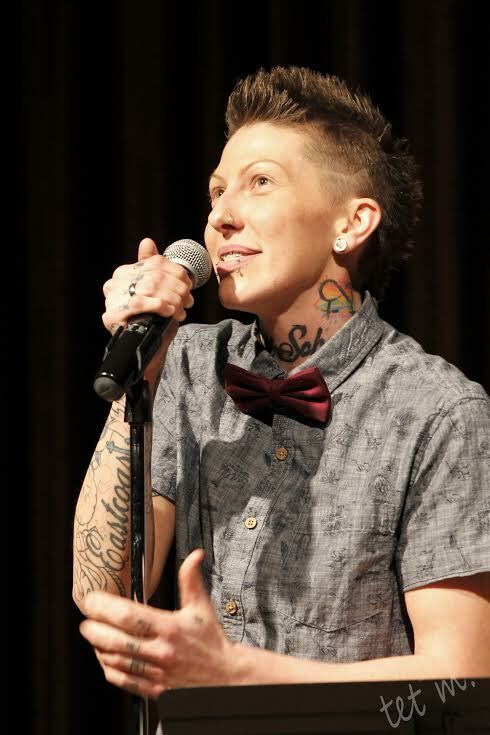 Renee has been a part of the arts community and the queer community for quite some time. They have used intimate connections in this film to create an atmosphere of personal experiences. This is Renee’s first time making a film, though will not likely be their last. In this short documentary, Calgary queer leaders from the 1990’s recount a decade of turmoil, loss, and growth of activism and human rights. SNAPSHOTS presents first-hand accounts of the frontlines of LGBTAQ+ activism at a time when the right to be out in Alberta was not legally protected, and when the very existence of queerness was threatened with slander and violence. This film was created with the purpose of fostering discussion on the rapid development of community-level queer activism in Alberta, through both progress and regression, over the past two decades. Leah Schmidt is a double-major in Women’s Studies and International Relations at the University of Calgary. She is a passionate advocate for social justice issues and marginalized identities, and dedicated to expanding the reach of intersectional activist-based educational pedagogy in universities. Following her degree, Leah is committed to pursing the tenets of international human rights and queer political activism through non-profit work and striving to be an advocate for marginalized voices, as seen through her work with the Identity and Discrimination Unit of Amnesty International in Washington, D.C., her efforts with the Girls and Young Women Advisory Council under the Government of Canada, and her current role as Coordinator of Q: The Student’s Union Centre for Sexual and Gender Diversity. Duane Stewart, a two spirited, First Nation’s youth from Haisla Nation in Northern BC shares his story of coming out, and the importance of his culture in his identity. Amar shares his journey as a queer South Asian activist, and how it intersects with his identity and culture as a deaf person. Celebration Gala to follow at The Naked Leaf!